This article is about the novel. For other uses, see Anne of Green Gables (disambiguation). Anne of Green Gables is a 1908 novel by Canadian author Lucy Maud Montgomery (published as L. M. Montgomery). Written for all ages, it has been considered a classic children's novel since the mid-twentieth century. Set in the late 19th century, the novel recounts the adventures of Anne Shirley, an 11-year-old orphan girl, who is mistakenly sent to two middle-aged siblings; Matthew and Marilla Cuthbert, originally intending to adopt a boy to help them on their farm in the fictional town of Avonlea on Prince Edward Island. The novel recounts how Anne makes her way through life with the Cuthberts, in school, and within the town. Since its publication, Anne of Green Gables has sold more than 50 million copies and has been translated into at least 36 languages. Montgomery wrote numerous sequels, and since her death, another sequel has been published, as well as an authorized prequel. The original book is taught to students around the world. The book has been adapted as films, made-for-television movies, and animated and live-action television series. Musicals and plays have also been created, with productions annually in Europe, and Japan. In writing the novel, Montgomery was inspired by notes she had made as a young girl about a couple who were mistakenly sent an orphan girl instead of the boy they had requested yet decided to keep her. She drew upon her own childhood experiences in rural Prince Edward Island, Canada. 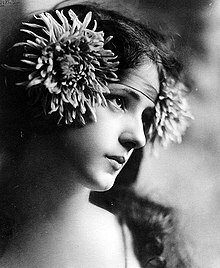 Montgomery used a photograph of Evelyn Nesbit, which she had clipped from New York's Metropolitan Magazine and put on the wall of her bedroom, as the model for the face of Anne Shirley and a reminder of her "youthful idealism and spirituality." Montgomery was inspired by the "formula Ann" orphan stories (called such because they followed such a predictable formula) which were popular at the time and distinguished her character by spelling her name with an extra "e". She based other characters, such as Gilbert Blythe, in part on people she knew. She said she wrote the novel in the twilight of the day, while sitting at her window and overlooking the fields of Cavendish. Anne Shirley, a young orphan from the fictional community of Bolingbroke, Nova Scotia (based upon the real community of New London, Prince Edward Island), is sent to live with Marilla and Matthew Cuthbert, siblings in their fifties and sixties, after a childhood spent in strangers' homes and orphanages. Marilla and Matthew had originally decided to adopt a boy from the orphanage to help Matthew run their farm at Green Gables, which is set in the fictional town of Avonlea (based on Cavendish, Prince Edward Island). Through a misunderstanding, the orphanage sends Anne instead. Anne is fanciful, imaginative, eager to please, and dramatic. However, she is defensive about her appearance, despising her red hair and pale, thin frame, but liking her nose. She is talkative, especially when it comes to describing her fantasies and dreams. At first, stern Marilla says Anne must return to the orphanage, but after much observation and consideration, along with kind, quiet Matthew's encouragement, Marilla decides to let her stay. Anne takes much joy in life and adapts quickly, thriving in the close-knit farming village. Her imagination and talkativeness soon brighten up Green Gables. 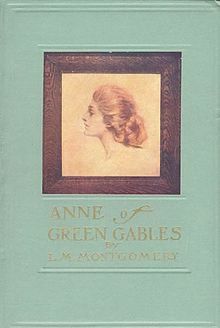 The book recounts Anne's struggles and joys in settling in to Green Gables (the first real home she's ever known): the country school where she quickly excels in her studies; her friendship with Diana Barry, the girl living next door (her best or "bosom friend" as Anne fondly calls her); her budding literary ambitions; and her rivalry with her classmate Gilbert Blythe, who teases her about her red hair. For that, he earns her instant hatred, although he apologizes several times. Although, as time passes, Anne realizes she no longer hates Gilbert, her pride and stubbornness keep her from speaking to him. The book also follows Anne's adventures in Avonlea. Episodes include play-time with her friends Diana, calm, placid Jane Andrews, and beautiful, boy-crazy Ruby Gillis. She has run-ins with the unpleasant Pye sisters, Gertie and Josie, and frequent domestic "scrapes" such as dyeing her hair green while intending to dye it black, and accidentally getting Diana drunk by giving her what she thinks is raspberry cordial but which turns out to be currant wine. At sixteen, Anne goes to Queen's Academy to earn a teaching license, along with Gilbert, Ruby, Josie, Jane, and several other students, excluding Diana, much to Anne's dismay. She obtains her license in one year instead of the usual two and wins the Avery Scholarship awarded to the top student in English. This scholarship would allow her to pursue a Bachelor of Arts (B.A.) degree at the fictional Redmond College (based on the real Dalhousie University) on the mainland in Nova Scotia. Near the end of the book, however, tragedy strikes when Matthew dies of a heart attack after learning that all of his and Marilla's money has been lost in a bank failure. Out of devotion to Marilla and Green Gables, Anne gives up the scholarship to stay at home and help Marilla, whose eyesight is failing. She plans to teach at the Carmody school, the nearest school available, and return to Green Gables on weekends. In an act of friendship, Gilbert Blythe gives up his teaching position at the Avonlea School to work at the White Sands School instead, knowing that Anne wants to stay close to Marilla after Matthew's death. After this kind act, Anne and Gilbert's friendship is cemented, and Anne looks forward to what life will bring next. Anne Shirley: An imaginative, talkative, red-haired orphan who comes to live with Matthew and Marilla Cuthbert at age 11. Anne is very sensitive and dislikes the colour of her hair. Anne's bleak early childhood was spent being shuttled from household to household, caring for younger children. She is excited to finally have a real home at Green Gables. Marilla Cuthbert: Matthew's sister, an austere but fair woman who has the "glimmerings of a sense of humor." Her life has been colourless and dull until the arrival of Anne. She tries to instill discipline in the child, but grows to love Anne's vivacity and joy. Matthew Cuthbert: Marilla's brother, a shy, kind man who takes a liking to Anne from the start. The two become fast friends, and he is the first person who has ever shown Anne unconditional love. Although Marilla has primary responsibility for rearing Anne, Matthew has no qualms about "spoiling" her and indulging her with pretty clothes and other frivolities. Diana Barry: Anne's bosom friend and a kindred spirit. Anne and Diana become best friends from the moment they meet. She is the only girl of Anne's age who lives close to Green Gables. Anne admires Diana for being pretty and for her amiable disposition. Diana lacks Anne's vivid imagination but is a loyal friend. Gilbert Blythe: A handsome, smart, and witty classmate, two years older than Anne, who has a crush on her. 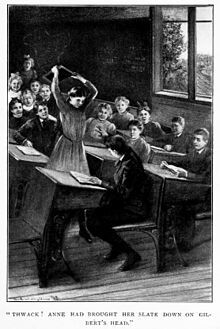 Unaware of Anne's sensitivity about her red hair, he tries to get her attention by holding her braid and calling her "Carrots" in the classroom, and she breaks a slate over his head. Despite his attempts at apology, Anne's anger and stubbornness prevent her from speaking to him for several years. By the end of the book however, they reconcile and become good friends. Ruby Gillis: Another of Anne's friends. Having several "grown up" sisters, Ruby loves to share her knowledge of beaux with her friends. Ruby is beautiful, with long golden hair. Jane Andrews: One of Anne's friends from school, she is plain and sensible. She does well enough academically to join Anne's class at Queen's. Josie Pye: A classmate generally disliked by the other girls (as are her siblings), Josie is vain, dishonest, and jealous of Anne's popularity. Mrs. Rachel Lynde: A neighbour of Matthew and Marilla, Mrs. Lynde is a noted busybody, but is also industrious and charitable. Although she and Anne start off on the wrong foot, owing to Mrs. Lynde's blunt criticism and Anne's short temper, they soon become quite close. Mrs. Lynde is married and has raised ten children. Mr. Phillips: Anne's first teacher at Avonlea, Mr. Phillips is unpopular with students. In Anne's case, he continually misspells her name (without the "E") and punishes only her among twelve pupils who arrive late. Once, he punished Anne for showing such a temper to Gilbert Blythe. He is described as lacking discipline, and "courts" one of his pupils openly. Miss Muriel Stacy: Anne's energetic replacement teacher. Her warm and sympathetic nature appeals to her students, but Avonlea's conservative parents disapprove of her liberal teaching methods. Miss Stacy is another "kindred spirit," whom Anne views as a mentor. Miss Stacy encourages Anne to develop her character and intellect and helps prepare her for the entrance exam at Queen's Academy. Reverend and Mrs. Allan: The minister and his wife also befriend Anne, with Mrs. Allan becoming particularly close. She is described as pretty and is a "kindred spirit." Mr. & Mrs. Barry: Diana's parents. Mr. Barry farms. Near the end of the book, he offers to rent some tracts to help out Anne and Marilla, after Matthew's death. Mrs. Barry is a strict parent. After Anne accidentally gets Diana drunk, Mrs. Barry forbids Diana to have anything to do with Anne. This sanction is repealed after Anne saves Minnie May. Minnie May Barry: Diana's baby sister, whose life is saved by Anne when she becomes infected with croup. Miss Josephine Barry: Diana's great-aunt. She is initially severe, but is quickly charmed and entertained by Anne's imagination, and invites her and Diana to tea. She refers to Anne as "the Anne-girl" and even sends Anne beaded slippers as a Christmas present. Mrs. Hammond: Anne lives with her for a portion of her pre-Green-Gables life and cares for Mrs. Hammond's three sets of twins. Anne is sent to the Hopetown orphan asylum when Mrs. Hammond is forced to break up her home after her drunken husband's death. Based on the popularity of her first book, Montgomery wrote a series of sequels to continue the story of her heroine Anne Shirley. They are listed chronologically below, by Anne's age in each of the novels. The following books focus on Anne's children, or on other family friends. Anne appears in these volumes, but plays a lesser part. The prequel, Before Green Gables (2008), was written by Budge Wilson with authorization of heirs of L. M. Montgomery. The province and tourist facilities have highlighted the local connections to the internationally popular novels. Anne of Green Gables has been translated into 36 languages. "Tourism by Anne fans is an important part of the Island economy". Merchants offer items based on the novels. The Green Gables farmhouse is located in Cavendish, Prince Edward Island. Many tourist attractions on Prince Edward Island have been developed based on the fictional Anne, and provincial licence plates once bore her image. Balsam Hollow, the forest that inspired the Haunted Woods and Campbell Pond, the body of water which inspired The Lake of Shining Waters, both described in the book, are located in the vicinity. In addition, the Confederation Centre of the Arts has featured the wildly successful Anne of Green Gables musical on its mainstage every summer for over five decades. The Anne of Green Gables Museum is located in Park Corner, PEI, in a home that inspired L.M. Montgomery. The novel has been very popular in Japan, where it is known as Red-haired Anne, and where it has been included in the national school curriculum since 1952. 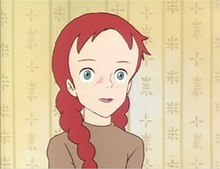 'Anne' is revered as "an icon" in Japan, especially since 1979 when this story was broadcast as anime, Anne of Green Gables. Japanese couples travel to Prince Edward Island to have civil wedding ceremonies on the grounds of the Green Gables farm. Some Japanese girls arrive as tourists with red-dyed hair styled in pigtails, to look like Anne. In 2014, Asadora 'Hanako to Anne' (Hanako Muraoka is the first translator in Japan) was broadcast and Anne became popular among old and young alike. A replica of the Green Gables house in Cavendish is located in the theme park Canadian World in Ashibetsu, Hokkaido, Japan. The park was a less expensive alternative for Japanese tourists instead of traveling to P.E.I. The park hosted performances featuring actresses playing Anne and Diana. The theme park is open during the summer season with free admission, though there are no longer staff or interpreters. The Avonlea theme park near Cavendish and the Cavendish Figurines shop have trappings so that tourists may dress like the book's characters for photos. Souvenir shops throughout Prince Edward Island offer numerous foods and products based on details of the 'Anne Shirley' novels. Straw hats for girls with sewn-in red braids are common, as are bottles of raspberry cordial soda. In the first book, Lucy Maud Montgomery established the cordial soda as the favorite beverage of Anne, who declares: "I just love bright red drinks!" The popularity of the books and subsequent film adaptations is credited with inspiring the design and naming of buildings "Green Gables". An example still standing is an apartment block called "Green Gables" built in the 1930s, in New Farm, Queensland, Australia. Bala's Museum, located in Bala, Ontario, Canada, is a house museum established in 1992 and dedicated to Lucy M. Montgomery information and heritage. The house was a tourist home owned by Fanny Pike when Montgomery and her family stayed there on a summer vacation in 1922. That visit to the region inspired the novel The Blue Castle (1926). The town is named Deerwood in the novel; this was Montgomery's only narrative setting outside Atlantic Canada. On May 15, 1975, Canada Post issued Lucy Maud Montgomery, Anne of Green Gables designed by Peter Swan and typographed by Bernard N.J. Reilander. The 8¢ stamps are perforated 13 and were printed by Ashton-Potter Limited. In 2008, Canada Post issued two postage stamps and a souvenir sheet honouring Anne and the "Green Gables" house. In 2003, Anne of Green Gables was ranked number 41 in The Big Read, a survey of the British public by BBC to determine the "nation's best-loved novel" (not children's novel). In 2012, it was ranked number nine among all-time children's novels in a survey published by School Library Journal, a monthly with primarily U.S. audience. Anne of Green Gables (1919), a silent film adapted to the screen by Frances Marion, directed by William Desmond Taylor, and starring Mary Miles Minter as Anne; this is considered a lost film. Anne of Green Gables (1934), directed by George Nichols Jr. and starring Dawn O'Day as Anne Shirley; after filming, O'Day changed her screen name to Anne Shirley. Anne of Windy Poplars (1940) – directed by Jack Hively, is a black & white "talkie" starring Dawn O'Day as Anne Shirley, now billed as "Anne Shirley". Anne of Green Gables (TBA), an upcoming feature film version of Anne of Green Gables: The Musical. Ana of California: A Novel (2015), by Andi Teran, is a "contemporary spin on Anne of Green Gables. The lead character of Anne Shirley has been adapted to Ana Cortez, a 15-year-old orphan who "can't tell a tomato plant from a blackberry bush" when she leaves East Los Angeles for the Northern California farm of Emmett and Abbie Garber. Anne of Green Gables (1941), a British radio drama produced and broadcast by BBC Home Service Basic, adapted into four parts by Muriel Levy, and starring Cherry Cottrell as Anne. Anne of Green Gables (1944), a recreation of the 1941 BBC Radio drama, produced and broadcast by BBC Home Service Basic. Anne of Green Gables (1954), a Canadian radio drama produced and broadcast by CBC Radio, adapted into 13 parts by Andrew Allen and starring Toby Tarnow as Anne. Anna zo Zeleného domu (1966), a Slovak radio drama produced and broadcast by Czechoslovak Radio, starring Anna Bučinská as Anne. Anne of Green Gables (1971), a British radio drama produced and broadcast by BBC Radio 4, adapted into 13 parts by Cristina Sellors, and read by Ann Murray. Anne of Green Gables (1997), a British radio drama produced and broadcast by BBC Radio 4, dramatized into five parts by Marcy Kahan and starred Barbara Barnes as Anne. Anne of Green Gables: The Musical, performed annually in the summer, at Charlottetown Festival, since 1965, this is Canada's longest-running main stage musical production, and has had a total audience of more than 2 million. Anne of Green Gables – The Musical was composed by Canadians Don Harron and Norman Campbell, with lyrics by Elaine Campbell and Mavor Moore. The production has been performed before Queen Elizabeth II and it has toured across Canada, the United States, and Europe. In 1969, it had a run in London's West End. The Charlottetown Festival production performed at the 1970 World's Fair in Osaka, Japan. Walter Learning directed and organized a successful national tour of the musical in Japan in 1991. The Guild in Charlottetown, Prince Edward Island, hosts Anne and Gilbert, The Musical. Written by Nancy White, Bob Johnston, and Jeff Hochhauser, the production is based on Montgomery's sequels featuring Anne Shirley. The Nine Lives of L.M. Montgomery, a musical adapted from Montgomery's novel and her life, opened at Kings Playhouse in Georgetown, Prince Edward Island on June 20, 2008, the 100th anniversary of the book's publication. With book and lyrics by Adam-Michael James and music by Emmy-nominated composer Leo Marchildon, the musical depicts events from Montgomery's life and features as characters heroines from all of her novels. Anne figures prominently, and is shown from age 12 into her 40s. Gilbert Blythe also appears. The show's second production was at the Carrefour Theatre in Charlottetown, Prince Edward Island and opened July 11, 2009. Both years, the musical was nominated for The Prince Edward Island Museum and Heritage Foundation's Wendell Boyle Award. In July 2010, a concert version of the show toured Prince Edward Island, with four performances at Green Gables. Theatreworks USA, a New York-based children's theatre company, produced an Anne of Green Gables musical in 2006 at the Lucille Lortel Theatre. A revived production, with musical contributions from Gretchen Cryer, is planned to tour grade-schools. The Peterborough Players, based in Peterborough, New Hampshire, staged an adaptation by Joseph Robinette of Anne of Green Gables in August 2009. Anne and Gilbert is a musical adaptation of the books Anne of Avonlea and Anne of the Island. It depicts the relationship of Anne and Gilbert during their years as teachers and college students, as well as their return to Avonlea. Anne of Green Gables, adapted by Julia Britton and Robert Chuter performed as a site-specific production at Rippon Lea, Melbourne, Australia December - February, 1996-97. Bend in the Road is a musical adaptation of Anne of Green Gables featured in the 2013 New York Musical Theatre Festival. The musical is written by Benita Scheckel and Michael Upward. Anne of Green Gables (1956), a made-for-television musical version directed by Norman Campbell and starring Toby Tarnow as Anne. Anne de Green Gables (1957), a French-Canadian television film directed by Jacques Gauthier, starring Mireille Lachance as Anne Shirley. Anne of Green Gables (1958), a recreation of the 1956 film directed by Don Harron, starring Kathy Willard as Anne. Anne of Green Gables (1972), a British made-for-television 5-part mini-series directed by Joan Craft, starring Kim Braden as Anne. Anne of Avonlea (1975), a British made-for-television 4-part mini-series directed by Joan Craft, starring Kim Braden as Anne. Anne of Green Gables (1985), a CBC four-hour television mini series directed by Kevin Sullivan with Megan Follows as Anne. Anne of Green Gables: The Sequel (1987), a sequel to the 1985 miniseries which aired on CBC and the Disney Channel as Anne of Avonlea: The Continuing Story of Anne of Green Gables. Anne of Green Gables: The Continuing Story (2000), a television miniseries based upon the novels. Anne of Green Gables: A New Beginning (2008), a television miniseries whose script is not based on the novels. L.M. Montgomery's Anne of Green Gables (2016), a 90-minute made-for-television adaptation of the book by Breakthrough Films & Television, which began filming in Toronto in May 2015. Casting was held in February 2015. (This replaces the previously announced 13-part series that had been set to film in 2013). It was adapted by Susan Coyne, directed by John Kent Harrison, and stars Ella Ballentine as Anne. The world premiere of the film, advertised under the abbreviated title Anne of Green Gables, on February 15, 2016 on YTV. Anne of Green Gables: The Good Stars aired on YTV on February 20, 2017. Anne of Green Gables: Fire & Dew, aired July 1, 2017 on YTV. Anne of Green Gables (1952), a BBC television series starring Carole Lorimer as Anne. Akage no An (1979; Red-Haired Anne), an animated television series, part of Nippon Animation's World Masterpiece Theater, produced in Japan and directed by Isao Takahata. Road to Avonlea (1990–1996) shown on CBC, a live-action television series produced by Kevin Sullivan, based upon characters and episodes from several of L.M. Montgomery's books, excluding Anne Shirley. Gilbert Blythe, Marilla Cuthbert, Rachel Lynde and other characters from the Anne books are included, and the series is set within the same continuity as Sullivan's 1980s miniseries. Anne of Green Gables: The Animated Series (2000), a PBS Kids animated series for older children ages eight to twelve, created by Sullivan Entertainment Inc.
Kon'nichiwa Anne: Before Green Gables (2009), part of the World Masterpiece Theater, this prequel to Akage no An is based on Budge Wilson's authorized prequel Before Green Gables (2008). Anne with an E (2017–present), a dramatic television series produced and broadcast by CBC in Canada and released through Netflix internationally. Green Gables Fables (2014–2016), an American-Canadian web series which conveys the story in the form of Tumblr posts, tweets, vlogs, and other social media. It is a modern adaptation of Anne of Green Gables and Anne of the Island, with many of its elements changed to better suit 21st-century culture. Mandy Harmon portrays the main character, Anne Shirley. Project Green Gables (2015–2016), a Finnish web series and a modern adaptation of Anne of Green Gables, which conveys the story in the form of vlogs. Laura Eklund Nhaga plays Anne Shirley. As one of the most familiar characters in Canadian literature, Anne of Green Gables has been parodied by several Canadian comedy troupes, including CODCO (Anne of Green Gut) and The Frantics (Fran of the Fundy). ^ Devereux, Cecily Margaret (2004). A Note on the Text. In Montgomery (2004), p.42. ISBN 978-1-55111-362-3. ^ Montgomery, Lucy Maud (2004) . Devereux, Cecily Margaret (ed.). Anne of Green Gables. Peterborough, Ontario: Broadview Press. ISBN 1-55111-362-7. ^ "'Anne of Green Gables' 1st edition sells at auction for US$37,000, a new record". The Guardian. December 12, 2009. ^ a b Mollins, Julie (March 19, 2008). "New Anne of Green Gables book stirs debate". Reuters Life!. Toronto. ^ "Anne of Green Gables New TV Series • Willow and Thatch". Willow and Thatch. 2016-08-24. Retrieved 2017-06-13. ^ "Tourists flock to see Anne of Green Gables-World-chinadaily.com.cn". www.chinadaily.com.cn. ^ a b Gammel, Irene (2009). Looking for Anne of Green Gables: The Story of L. M. Montgomery and her Literary Classic. New York: St. Martin's Press. ^ "Anne of Green Gables". ^ Gammel, Irene (July 8, 2008). Looking for Anne of Green Gables: The Story of L. M. Montgomery and Her Literary Classic. Macmillan. ISBN 978-0-312-38237-7 – via Google Books. ^ Gammel, Irene (2009). "The Mystery of Anne Revealed,". Looking for Anne of Green Gables: The Story of L. M. Montgomery and her Literary Classic. New York: St. Martin's Press. ^ "The Geography of Anne of the Island". lmm-anne.net. 2008. Archived from the original on 2011-07-23. ^ "Birthplace of L. M. Montgomery, New London". lmm-anne.net. 2008. Archived from the original on 2011-07-23. "Anne of Green Gables has sold millions of copies in more than 36 languages"
^ CBC News (June 19, 2008). CBC.ca, "100 years of Anne of Green Gables". ^ "Anne of Green Gables-The Musical". Archived from the original on 2016-10-02. Retrieved September 30, 2016. ^ "Anne Museum - Park Corner, Prince Edward Island - Home Page". www.annemuseum.com. ^ Yuka Kajihara (April 4, 2004). "Anne in Japan FAQ 1.0". Yukazine.com. Archived from the original on July 18, 2011. Retrieved June 6, 2011. ^ "Anne of Green Gables theme park in Japan falls on hard times". CBC News. Retrieved 2017-04-27. ^ "Cloning Anne of Green Gables". Tacky Tourist Photos. Archived from the original on July 16, 2011. Retrieved June 6, 2011. ^ "The Heroine's Bookshelf: Anne of Green Gables". Theheroinesbookshelf.com. October 12, 2010. Archived from the original on July 17, 2011. Retrieved June 6, 2011. ^ "In search of Anne with some unexpected discoveries". State Library of Queensland. 2016-02-15. Retrieved February 2, 2016. ^ "History: A look back at the last 20 years". Bala's Museum with Memories of Lucy Maud Montgomery. Retrieved October 30, 2015. ^ Montgomery, Lucy Maud (12 February 2018). "The Blue Castle". Bibliotech Press – via Google Books. ^ Depository, Book. "The Blue Castle : Lucy Maud Montgomery : 9781618950239". www.bookdepository.com. ^ "Canadian Postal Archives Database". collectionscanada.gc.ca. Archived from the original on 2013-01-01. ^ "Canada Post – Anne of Green Gables". Canada Post. Retrieved 2012-03-16. ^ "The Big Read – Top 100". BBC. April 2003. Retrieved October 27, 2012. ^ Bird, Elizabeth (July 7, 2012). "Top 100 Chapter Book Poll Results". A Fuse #8 Production. Blog. School Library Journal (blog.schoollibraryjournal.com). Retrieved October 30, 2015. ^ "New Anne of Green Gables film announced". cbc.ca. 10 September 2013. ^ Teran, Andi (June 2015). Ana of California: A Novel. Penguin Books. ^ "BBC Home Service Basic - 21 April 1944 - BBC Genome". genome.ch.bbc.co.uk. ^ "Panáček v říši mluveného slova". mluveny.panacek.com. ^ "Anne of Green Gables". 9 September 1971. p. 37 – via BBC Genome. ^ "BBC Radio 4 FM - 26 January 1997 - BBC Genome". genome.ch.bbc.co.uk. ^ "25 Hundred and Counting". 22 August 2017. ^ McIntosh, Andrew. "Lucy Maud Montgomery". ^ "Charlottetown expands as Land of Musical Anne - The Guardian". www.theguardian.pe.ca. ^ "The Nine Lives of L.M. Montgomery". Ninelivesoflmm.com. February 15, 2012. Retrieved November 3, 2013. ^ "TheatreworksUSA 2006 - 2007 season". 19 October 2017. ^ "PeterBoroughPlayers.org". PeterBoroughPlayers.org. Archived from the original on July 27, 2011. Retrieved June 6, 2011. ^ Robinson, Joanna. "Anne of Green Gables: Netflix's Bleak Adaptation Gets It All So Terribly Wrong". ^ Giltz, Michael (2013-07-29). "Theater: Murder For Two; NYMFC #4 Orphans, Olympians and Onanism!". Huffington Post. Retrieved 2019-01-10. ^ "Bend in the Road". www.nymf.org. Retrieved 2019-01-10. ^ "In Production – ANNE OF GREEN GABLES TV Movie". Ontario Film Commission. May 15, 2015. Retrieved May 21, 2015. ^ "MAJOR UPDATE: ANNE OF GREEN GABLES ADAPTATION BY BREAKTHROUGH ENTERTAINMENT". L.M. Montgomery Online. April 1, 2015. Retrieved May 21, 2015. ^ "Canada Wide Casting for Anne of Green Gables (Movie of the Week)". ACTpei. February 9, 2015. Retrieved May 21, 2015. ^ "Anne of Green Gables returns to TV". CBC News. June 11, 2012. Retrieved June 21, 2012. ^ "Anne of Green Gables Movies 1 X 90". Breakthrough Entertainment. Retrieved May 21, 2015. ^ "Anne of Green Gables set for new life on CBC-TV". CBC. Retrieved January 12, 2016. ^ "Netflix Boards CBC's 'Anne Of Green Gables' Adaptation; Niki Caro To Helm Premiere". Deadline. August 22, 2016. ^ "合宿免許を使うメリット – 合宿免許先を選ぶなら宿泊施設を見るべき？". www.greengablesfables.com. ^ "About". www.projectgreengables.com. Archived from the original on 2017-04-27. Retrieved 2017-04-27. Bustard, Ned (January 2009). Anne of Green Gables Comprehension Guide. Veritas Press. ISBN 978-1-932168-79-2. Campbell, Norman (1972). Anne of Green Gables. Samuel French, Inc. ISBN 978-0-573-68002-1. Gammel, Irene (2008). Looking for Anne of Green Gables: The Story of L.M. Montgomery and her Literary Classic. authorized by the heirs of L. M. Montgomery. Gammel, Irene; Benjamin Lefebvre (May 30, 2010). Anne's World: A New Century of Anne of Green Gables. University of Toronto Press. ISBN 978-1-4426-1106-1. Montgomery, Lucy Maud (June 3, 2008). The Green Gables Collection. Doubleday Canada. ISBN 978-0-385-66599-5. Teran, Andi (June 2015). Ana of California. Penguin Books. ISBN 978-0-14-312649-2. "L.M. Montgomery Research Centre", University of Guelph Library Archival & Special Collections. "Top 100 Children's Novels #9". School Library Journal Blog. Retrieved 2012-05-20.